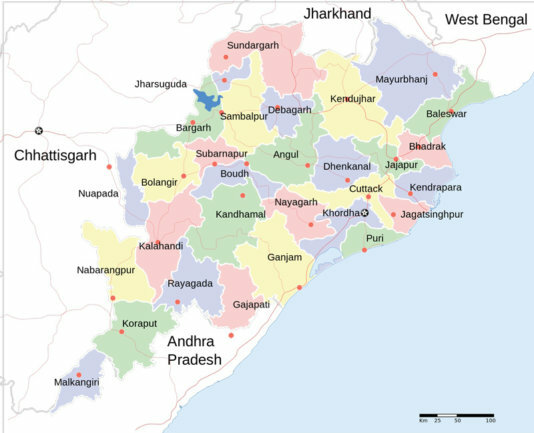 Her relatives, who suspected her of practising witchcraft, beat an Indian woman to death in the central Indian state of Chhattisgarh. Not a single case as it shows. The 51-year-old Dadai Bai died in Kondagaon after she was stripped and beaten by some people from her village and other relatives. They had accused her of making a village boy ill by practising witchcraft. The “witch hunting” is most prevalent in the tribal-dominated villages of Madhya Pradesh, the Chhattisgarh and Orissa states. The tribe women are the victims of this evil superstition even today. Few months back, Sewa Bai was brutally thrashed and then paraded naked in the whole village in Dindori, district of Madhya Pradesh. The villagers attacked her. Ironically, she had been living with them in the village for years but even her neighbours didn’t trust her and were apparently led into believing that she was a witch. Sewa Bai’s case is not an isolated one. Many similar cases come to light every year in this region. What is most baffling is that these cases find no place in the government statistics. The attitude of the police is also very discouraging. They often turn a blind eye to such incidents or advise the people to settle the matter among themselves. Sewa Bai had to face the wrath of the people when a boy died in the village and she was held responsible for his death. According to social activist Dr. Dinesh Mishra witchcraft is quite common in tribal villages, and the women are often treated like animals. The system is such that the victims often shy away from making complaint to the police because they fear reprisal by the fellow villagers. Ojhas (sorcerers or witch doctors) claim they can easily spot a witch. For providing this ‘service’ they take goat, wine and fowl from the villagers. Ojha Santam Singh, who lives in a village in the Khargone district of Madhya Pradesh, says that he has got the power to pick out a witch. Once branded a witch, the woman has to face the wrath of the villagers. Dr. Dinesh Mishra says, “The majority of women is so humiliated that they fear living in their home village.” He believes that there is need to create greater awareness among people. But most importantly it is necessary to find the root cause behind such incidents. Mostly they are not just “magic”, witchcraft or superstition, but there are social and economic reasons. Sometimes it is enough, when a women demands share in property or failure to establish sexual relations. In some cases, the woman is pressurised to give up her rightful claim on the property after her husband’s death. If she does not agree then the issue is decided through the sorcerer, who is often bribed to declare the woman as witch. It is evident that law alone cannot help to end this evil in tribal areas, but a large-scale awareness drive should be launched targeting the community. Photo: indiatoday. Read more from their article. 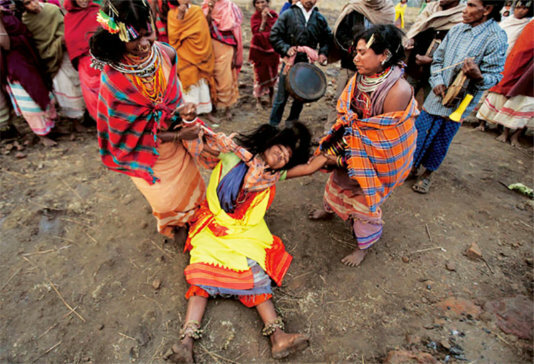 A 'witch' is being 'cured of evil possession' during a ceremony.